There are only 2 weeks left for the Ron Mueck exhibit at the Museum of Fine Arts Houston. 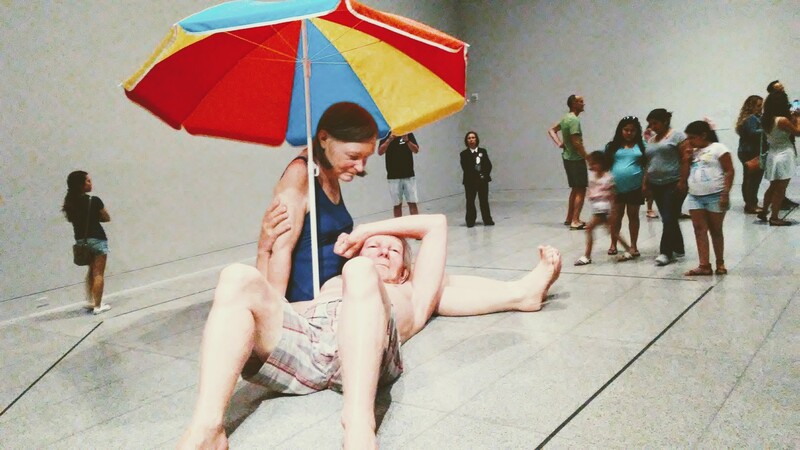 Ron Mueck, the son of German emigres, was born in Melbourne and cut his teeth in the film and television industry, working in both London and the U.S., before making the foray into fine arts in the late 90s. The collection currently on exhibition at the MFAH summarizes the trajectory of his journey as an artist. The verisimilitude of the sculptures–especially the ones the size of large sedans– are unsettling at times. But it is also wondrous just thinking about the sheer amount of meticulousness that went into producing the minute details: you can see every follicle, every furrow and wrinkle, every vein, and every carbuncle. It was a humbling and sometimes haunting experience. Setting aside the startling realism, a lot of the works offer somber commentary on a myriad of existential concepts like birth, youth, death, and oblivion. There’s also a giant chicken hanging from the ceiling. Make of that what you will. I highly recommend y’all check out this highly unique exhibit.